Most of us camping on Garden Key stand together on the beach watching the light fade from the western sky. 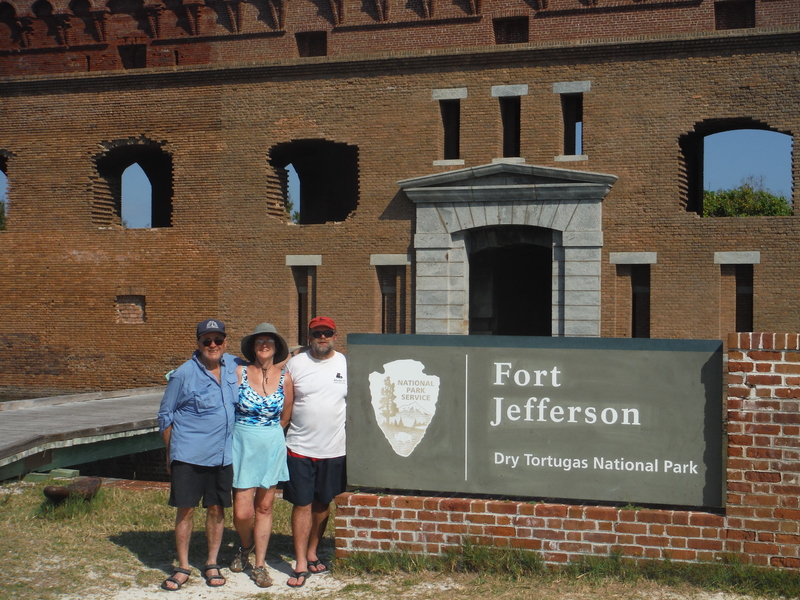 The skies are mostly clear and the water surrounding the Key and Fort Jefferson ripples in from the southerly wind. There’s a group of four women from South Florida along with several group of bird watchers from around the country. Soon a star appears in the southwest, Sirius, the Dog Star as well as Venus just above the horizon in the West. A few minutes later, the sky is darker. Rigel and Betelgeuse, the red star in Orion, are visible. “There’s Orion, setting early after having been up high all winter,” I say as I point out the stars. Soon we can make out the stars in Orion’s belt. In the spring, it appears as if the hunter is falling face-first out of the sky. A little later, all the stars of Orion and his faithful dog, Canis Major, are clearly visible. Other constellations pop out: Auriga, the charioteer; the V in Taurus the Bull; and Pleiades, the Seven Sisters. In mythology, the seven sisters looked out for travelers. We’re all travelers here, enjoying a few days 70 miles from civilization. There are no signals on our cell phones and no way to connect to the internet unless someone brought an antenna a for a satellite hookup. I look back behind me, to the northeast, and see the Big Dipper climbing higher in the sky. From it, I can easily find the North Star, low on the northern horizon, just above the ramparts of the fort. I point it out to the group. “How you know so much about the stars,” one of the women from Miami asks. Slowly people drift back to their tents. It’s been a tiring day as my sister, father and I had gotten up at 4:30 AM, in order to have our gear and kayaks at the ferry terminal at 6 AM for the run from Key West to the Tortugas. 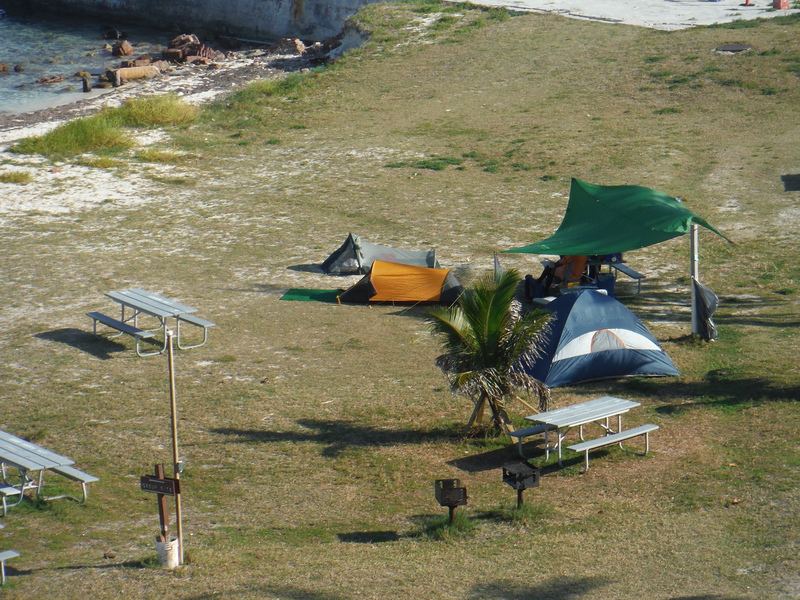 Then we had to set up camp before a cooling snorkel around the outside of the fort’s moot. After dinner, we paddled out by Bush and Long Key. 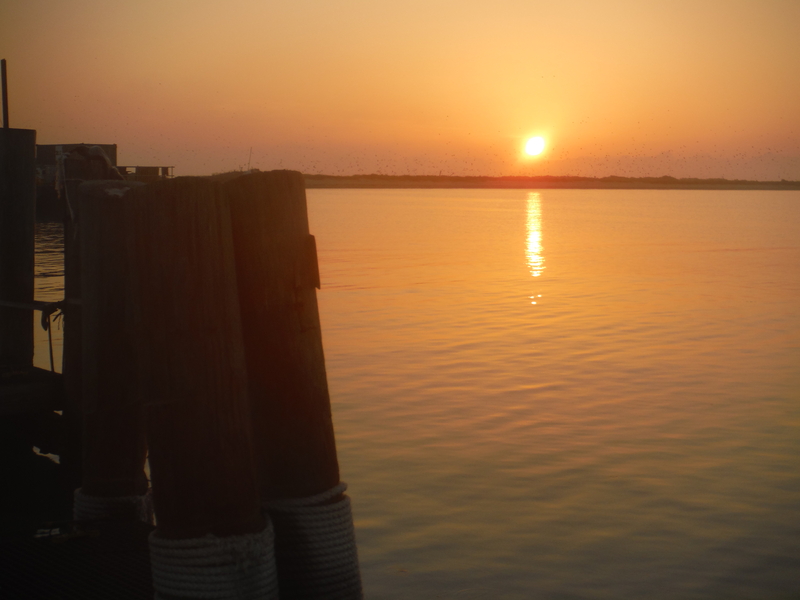 The islands are closed off due to nesting, but we are allowed to paddle by them as long as we stay 100 feet offshore. Sooty Terns and Brown Noodles flying from Bush Key. My father is in the kayak. 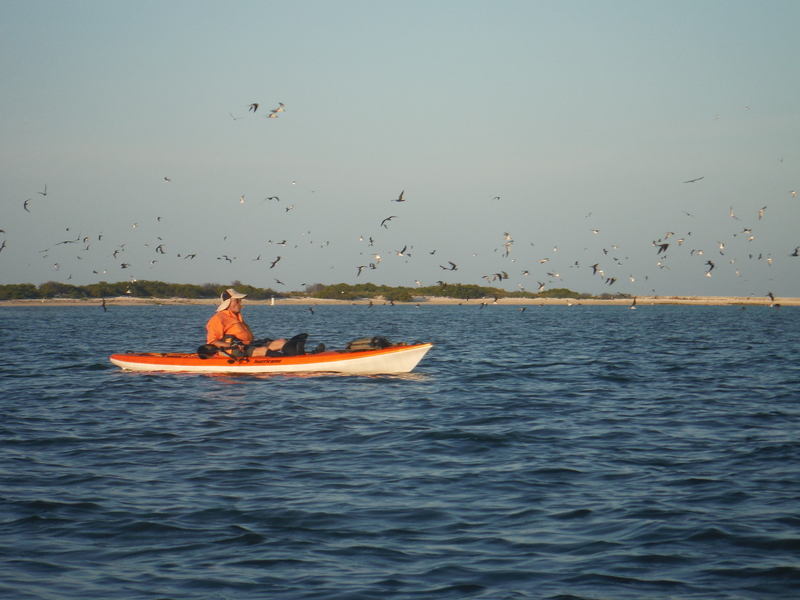 While paddling by Bush Key, where tens of thousands of Snooty Terns nest, birds dotted the sky. I don’t know if any of these birds spend time on the nest. They mostly fly around the key and out over the water, constantly chirping with one another. 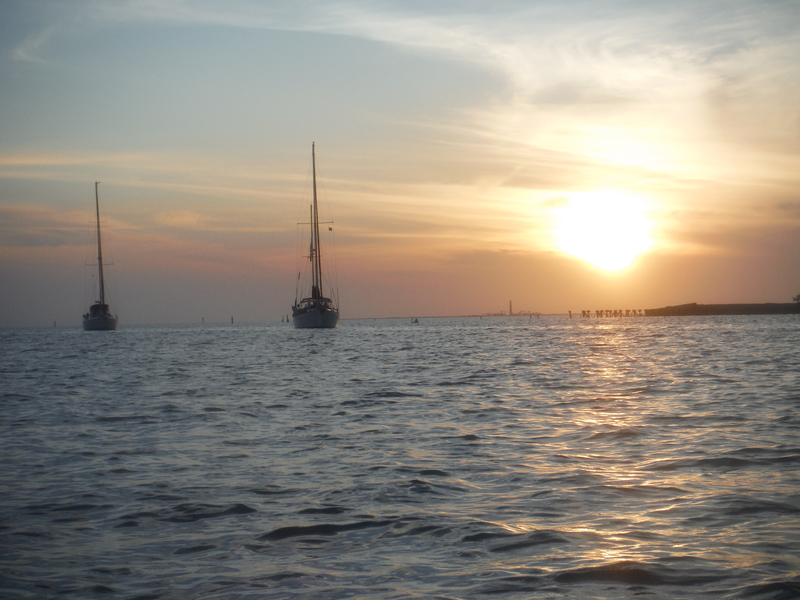 On Long Key, frigates are nesting. These large birds are as graceful as any navy frigate and the males, who puff up a red pouch under their head to attract females are able to strut better than any sailor on shore leave. At nine-thirty, I crawl into my bivy tent. The wind is blowing hard and the tarp, what we erected to protect us from the tropic sun, flaps constantly. I am soon asleep. I arise at 6:30 am. The eastern sky is bright red. My sister has already started the charcoal in my stove and boiled water for her tea. I put coffee and water in my camping percolator and in a few minutes can see the water turn into dark black coffee. When Dad gets up, we have breakfast. I’ve brought oatmeal. My sister has boiled eggs and precooked bacon and grits. We cut up some fruit and split it between us. 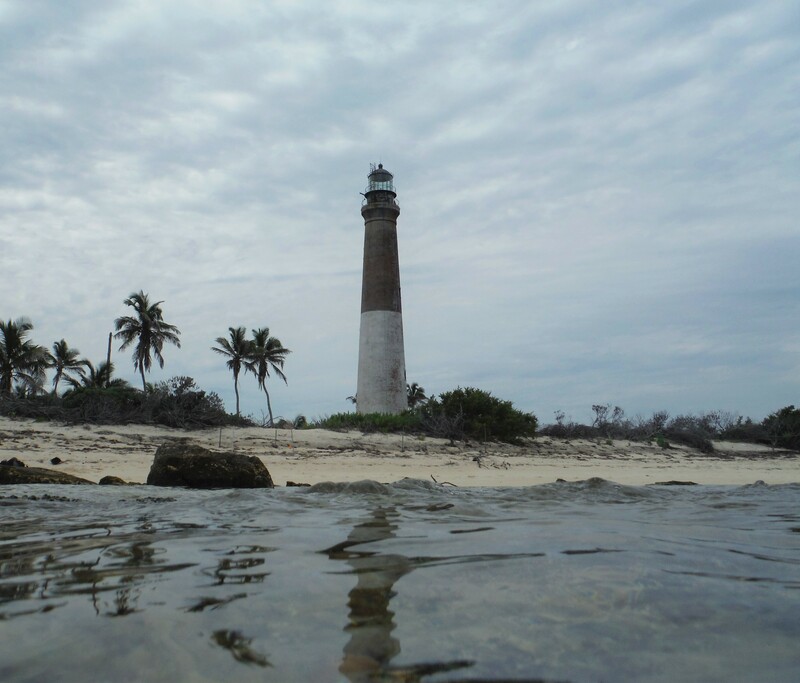 Our plan is to paddle to Loggerhead Key, which is located three miles to the west of Garden Key, the location of a long standing lighthouse (that went dark in 2014 and is no longer in use). We pack lunches and snorkel gear. I have a marine radio, but the rangers insist we take at least one more and loan my sister one. Although the tide doesn’t vary much here (just a foot to eighteen inches) it does create a flow that runs the channel between the two keys, so we are warned to watch for currents. Unless a fog rolls in, which doesn’t seem likely in this weather, we’ll not have any problem as long as we stay focused on the Loggerhead lighthouse which rises 150 feet above the small strip of land. The wind is still strong and coming out of the south, which requires us to paddle harder than normal. About a quarter way to the island, my sister complains of her hands hurting and decides to go back to Garden Key. We were told that on a calm day it’d take an hour to paddle to the island and generally two hours to paddle back. My dad and I keep paddling. It takes us almost an hour to paddle the three miles to Loggerhead, but that’s with a strong wind coming in at an angle, creating some swell. There, we’re met with two guys who took the dingy from their sailboat to the island to snorkel, along with the volunteer lighthouse tender. He has volunteered to stay on the island and watch over those who visit for a month. The park service provides him a home with electricity (they have huge panels of solar cells). 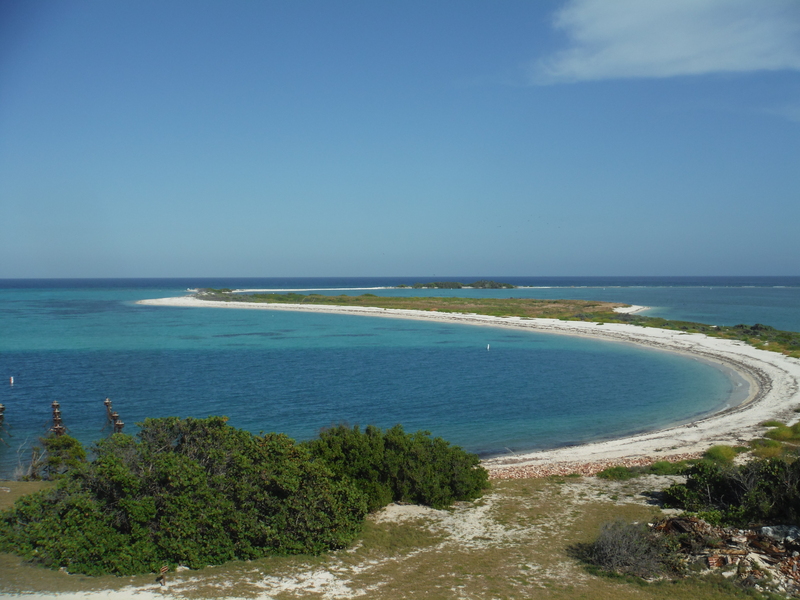 He checks in with visitors (he provided us with tips on where to snorkel), and operates a water desalination system that provides water to rangers in the Tortugas. He’s responsible for his own food. We walk across the island and snorkel on the west side. 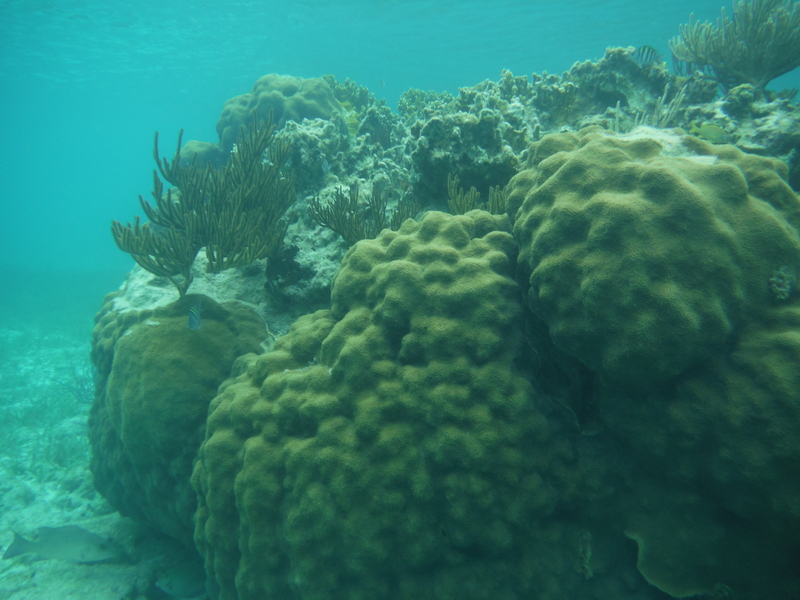 He points out some places to check out and we are blessed with seeing huge growths of brain coral along with large aquatic plants. I love the huge purple sea fans that half my size. 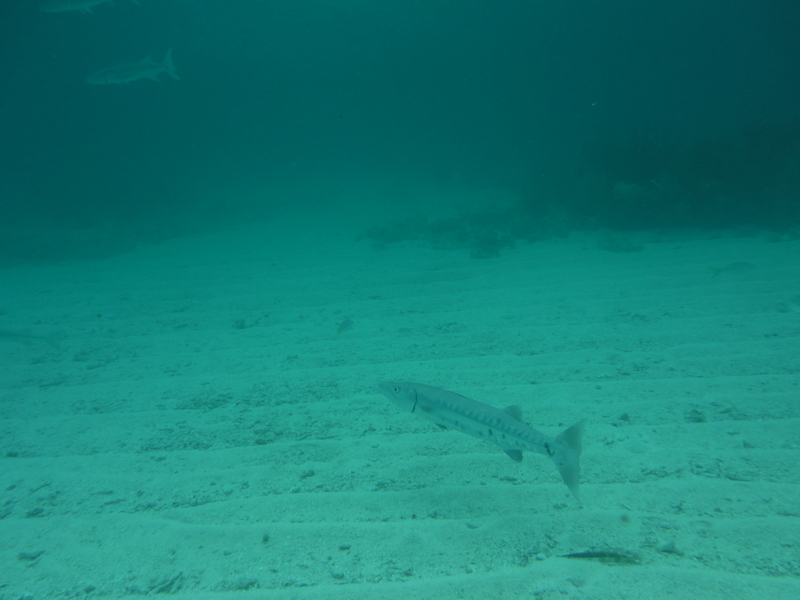 I see plenty of fish: angelfish, butterflyfish, a variety of snapper and grouper, the seemingly ubiquitous “Sergeant Majors”, and several large barracuda. Hiding inside hollow parts of the coral are long-spined sea urchin. After an hour and a half of snorkeling (my dad gave it up much earlier), I join him on the beach for lunch (Vienna sausage, cheese and crackers, a pear, and plenty of water). After lunch, I go back out and snorkel for another 40 minutes or so, before packing up and heading across the island to our kayaks. We leave at 1 PM. The wind has calmed and the paddle back is easy. We don’t rush it and find it only takes us a little over an hour and fifteen minutes, well less than the two hours we were told to expect. We make it back in time to buy some ice and ice cream on the ferry (it leaves at 2:45 PM). After resting, I join my sister with snorkeling around the fort. The wind begins to die and the sound of the flapping tarp is replaced by the squawk of the terns a few hundred yards to our east. We enjoy steak for dinner (they were frozen when we left but has since thawed), and steamed cauliflower that I’d brought from my garden. I am sure I’m the only person on this key eating homegrown cauliflower. 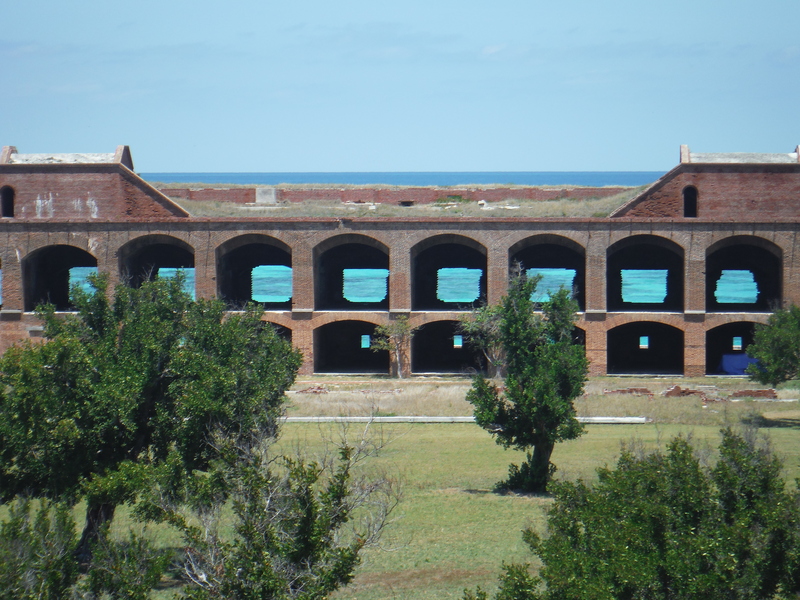 I spend some time in the late afternoon and evening inside the fort, finding a shady spot, where I read and journal. It’s been a long day and shortly after sunset, I’m in bed. There is no wind and it’s warm. I lay on top of my sleeping bag and fall asleep. Nature calls at 5 AM, and I crawl out of my tent to take care of business. The ground is soaked with a heavy dew. As I look up at the morning stars. The summer constellations are out. They are not generally this bright due to light pollution, but without any artificial light, the sky is brilliant. I easily spot Scorpius. It’s much higher above the southern horizon than I am accustomed to seeing it. At higher latitude, the constellation is often only partly seen above the southern horizon. This morning, its pinchers are reaching out as if to grab Jupiter. To the left of the scorpion is the winged-horse archer, Sagittarius. Its arrow is drawn and aimed at the deadly cosmic insect. Mars and Saturn appear to be resting on its wings. I’m treated with three planets in close proximity within the morning sky. There is no wind, but there is no silence either. I don’t think any of the terns on Bush Key sleep as they’re still squawking. I crawl back into my tent and snooze for another hour. Sounds like a beautiful and relaxing vacation with your family. Wow. Sounds like a great trip. And wow to your dad doing it. He must be into his 80s. I enjoyed so much about this post — for example, the descriptions of stars and other scenery you saw. But I loved reading about the time you had with your dad and sister. How great that you get to have this kind of experience with them. What a great way to spend time with your family! I love viewing the night sky (and don’t have a lot of light pollution where I live), but I’ve never been good at identifying what I’m seeing. The lighthouse is beautiful and sounds like good snorkeling. Interesting blog. Sounds like a nice adventure. Thanks for sharing this and all of the other interesting weekly items. Sounds wonderful. I only wish I had the stamina an guts to try it. What a beautiful way to experience God’s creation, with loved ones, and an understanding of nature! Thanks so much for sharing! I enjoyed the read and also your photographs.